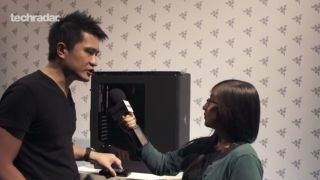 Our friends at Techradar joined Razer CEO Min-Liang Tan at the company's E3 booth for a video interview showing off the new NZXT H440 case and Kraken Neon headset line. We also get a look at the Junglecat, a mobile phone gamepad, but we expect you'll skip ahead to those new super-bright Krakens. The NZXT H440 case has some nice details and, naturally, glows Razer-green. It'll go for $159 USD in July, while the new line of Kraken headsets is available now, priced at $80.